2. 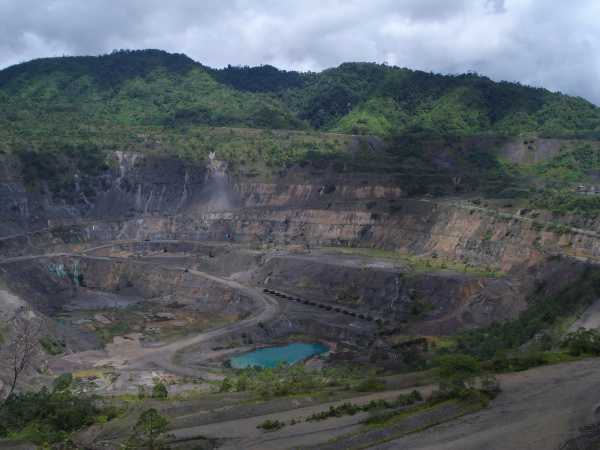 Issues with the shareholding in Bougainville Copper Ltd are still causing frustrations for the Bougainville Government. 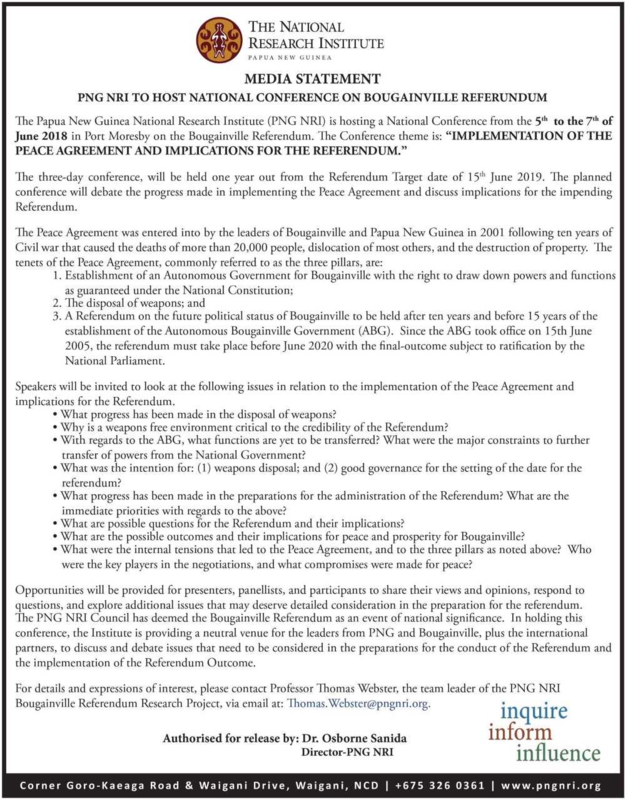 4.The PNG National Research Institute (PNG NRI) will be hosting a National Conference from the 5th to the 7th of June 2018 at the Stanley Hotel in Port Moresby on the Bougainville Referendum. The Conference theme is: “IMPLEMENTATION OF THE PEACE AGREEMENT AND IMPLICATIONS FOR THE REFERENDUM”. plan for a better future. 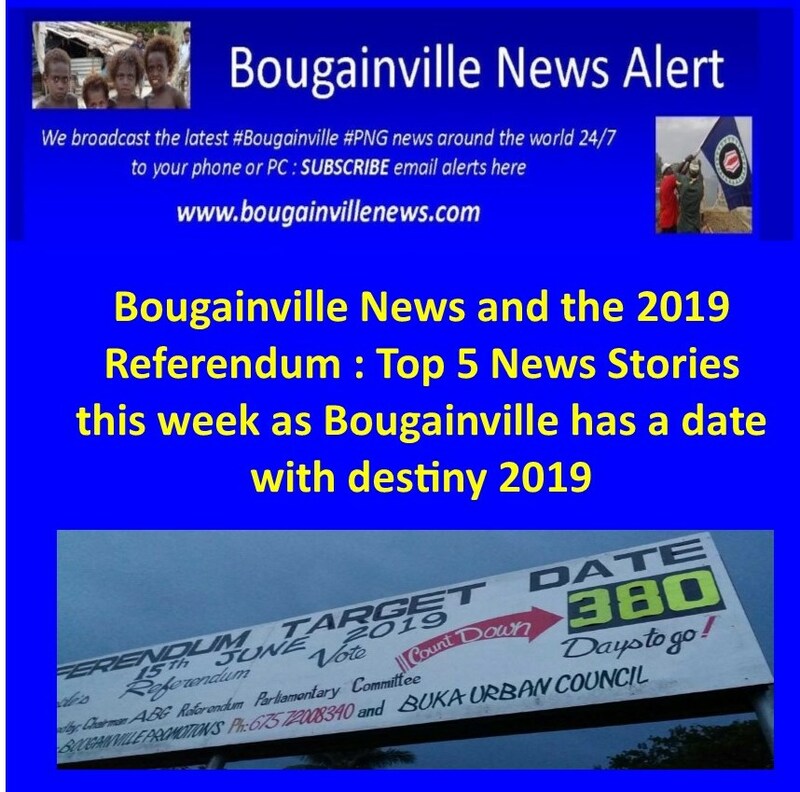 Part 1 : The Papua New Guinea government is not doing enough to support Bougainville as it prepares for a referendum on possible independence, a PNG MP says. Last week, Prime Minister Peter O’Neill told parliament the vote was not simply about independence but embraced a number of factors. He also said maintaining the country’s unity was all important. But the regional MP for Bougainville, Joe Lera, said as the province prepared for the vote in June next year, the PNG government had not been honouring its commitments under the Peace Agreement. The autonomous region of Bougainville is to hold a vote on possible independence from PNG next year – a step that marks the culmination of a 20 year peace process. Mr O’Neill told parliament former leaders would not want the country divided up, saying he would not want to let Bougainville go. He spoke of the need for unity and stability but Mr Lera, said the Peace Agreement was about enhancing peace and did not talk about unity. “The bottom line is the issue of independence is part of the Peace Agreement. So, for the prime minister to base his comments on unity, the unity is not in the Peace Agreement. But I understand where he is coming from because he doesn’t want the country to break up,” he said. Part 2 : Two years ago multinational Rio Tinto, which was the majority owner of BCL, ditched its commitments and gave its shares to the Papua New Government and the landowners of Bougainville. The autonomous Bougainville Government deemed the landowners shares go to it, giving it 36.4 percent of the company, according to the BCL website. But at a BCL board meeting last month the ABG was not permitted to vote in accordance with its shareholding. An ABG cabinet minister, Albert Punghau, says the share transfer from the PNG government has apparently not been completed. “The Prime Minister he said he would be giving it back to the Panguna landowners, through the ABG,” said Mr Panghau. The meeting in Arawa on June 14 is expected to also consider the PNG government’s failure to meet its earlier commitment to pay 20 million kina to Bougainville to help the Referendum Commission prepare for the vote on possible independence. The vote is scheduled for June 15, 2019. PNG is also yet to appoint two officials to join two Bougainville officials and former Irish prime minister Bertie Ahern, who is to head the body. Part 3 : Prime Minister Hon Peter O’Neill in responding to South Bougainville MP Timothy Masiu, regarding the issue that government officials should regularly visit the Autonomous Region of Bougainville. O’Neill says that he will go to Bougainville. PM O’Neill stressed that he will be in Arawa come June 14, that the government is committed to Bougainville and would honour every word in the Bougainville Peace Agreement. O’Neill said that the peace agreement will go according to the Papua New Guinea Constitution, we will not detour, O’Neill also said that he is not afraid to visit Bougainville and welcomes views and is ready to listen. We should not divide our country but stand as one, founders like, President John Momis, Sir Michael Somare, Sir Julius Chan did not want a division but to be united as one, other issues should not be an obstacle to the peace agreements. 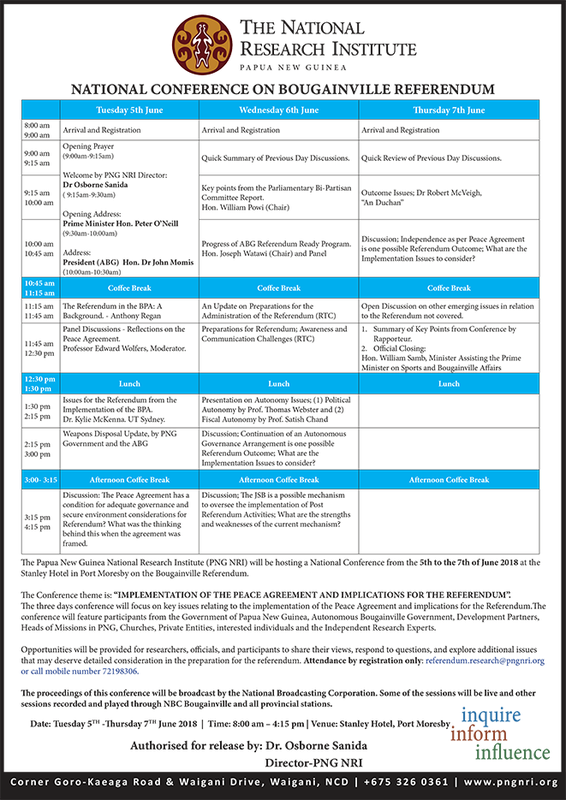 Part 4 : The PNG National Research Institute (PNG NRI) will be hosting a National Conference from the 5th to the 7th of June 2018 at the Stanley Hotel in Port Moresby on the Bougainville Referendum. The three days conference will focus on key issues relating to the implications for the Referendum. 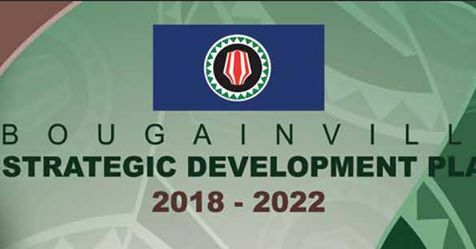 The conference will feature participants from the Government of Papua New Guinea, Autonomous Bougainville Government, Development Partners, Heads of Missions in PNG, Churches, Private Entities, interested individuals and the Independent Research Experts. 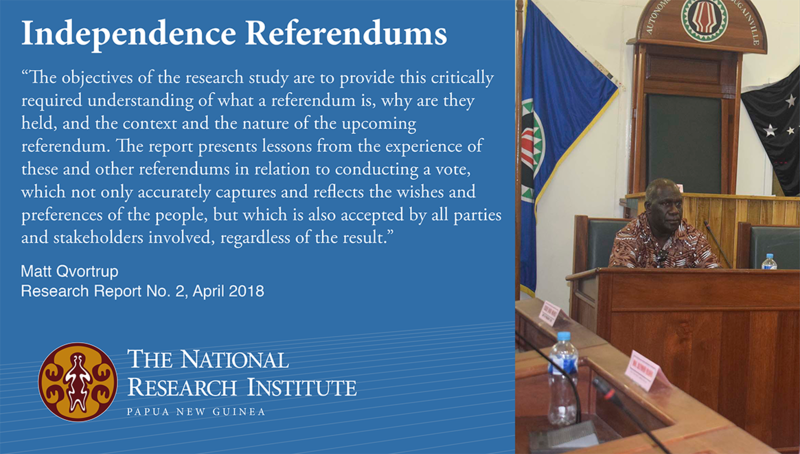 Opportunities will be provided for researchers, officials, and participants to share their views, respond to questions, and explore additional issues that may deserve detailed consideration in the preparation for the referendum. 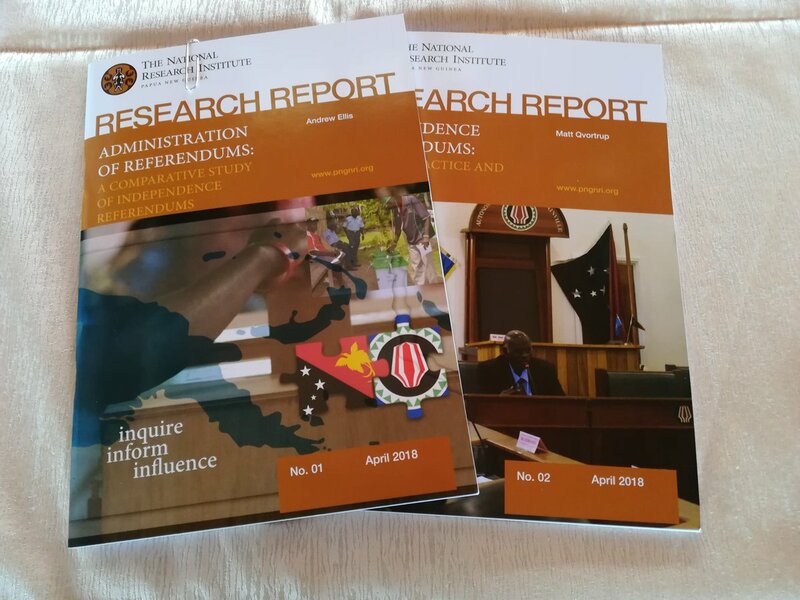 Attendance by registration only: referendum.research@pngnri.org or call mobile number 72198306. The proceedings of this conference will be broadcast by the National Broadcasting Corporation (NBC). Some of the sessions will be live and other sessions recorded and played through NBC Bougainville and all provincial stations. peacefully and let it be a process of integrity. move around Bougainville without the fear of violence. have to meet our needs. less privileged to have a little more. we go about the business of government.